Folate is a B-vitamin found highest in dark green vegetables, liver, fermented foods and drinks and certain fruits. DNA and RNA synthesis, DNA maintenance, methylation and healthy cell division are all dependant on folate status. Folate deficiency causes DNA instability, leading to a higher frequency of chromosome breaks during attempted DNA repair. It is the breaks in chromosomes and poor cell division that can lead to cancer and cognitive decline, with the homozygous MTHFR 677 genotype (Methylation section of the Nutrition Genome Report) being more susceptible to chromosomal damage from low folate. As the summer sun restores our vitamin D levels to prepare for next winter, the sun also increases our requirements for folate. This can be especially significant during pregnancy (a 20% reduction in folate was found in pregnant Australian women with high sun exposure) and with gene variants that increase folate requirements. The requirements for folate can range dramatically between individuals. Folate deficiency is considered to be one of the most common vitamin deficiencies and occurs in approximately 10% of the U.S. population. There are currently 8 major genes in the Nutrition Genome Report that are heavily influenced by folate status, with MTHFR 677 and MTHFR 1298 being considered the two top genes for methylfolate requirements. There is a difference between isolated folate in a supplement and consuming folate from food. Certain fruits and vegetables contain methylfolate and the whole spectrum of different types of folate that support the entire folate cycle for healthy DNA and RNA, along with other protective and synergistic vitamins, minerals, and compounds. Fermentation is truly a magical process that harnesses yeast and good bacteria from the air, who go to work on your food or drink, preserve it, make it safer to consume and increase the nutritional value by leaps and bounds. Before microbiology and microscopes, this process was truly seen as magic by cultures around the world. During fermentation, foods or drinks get a boost in vitamin content, produce organic acids (antibacterial and detox effects), create helpful antibiotics, anticarcinogens, cholesterol-lowering constituents, and inactivates of toxins. Studies have shown that fermentation can almost double the folate content of food, especially methylfolate. In India, Idli is a traditional dish of steam-fermented dough mixture of rice and black chickpeas. During the fermentation process, folate concentration increased by almost 60%. This means that for those of you that require a higher amount of methylfolate due to variants in MTHFR 677 or MTHFR 1298, fermented foods and drinks should be a staple. Kombucha is an excellent example of a fermented drink rich in B-vitamins. Sixteen ounces of Kombucha from certain companies have been tested to contain 50% of the RDI for folate, 40% of B1, 40% of B2, 40% of B3, 40% of B6, and 40% of B12. Pliny the Elder stated that “those persons who dieted upon fermented bread are stronger in body.” While refined flour and baking bread cause a degradation of B-vitamins, fermentation boosts the B-vitamin content due to the presence of yeast to help offset the losses. One study found that niacin increases ten-fold during sourdough rye fermentation. and more than doubled the amount of folate. Non-organic bread has, on average, 200mcg of fortified synthetic folic acid. Bread fortified with synthetic folic acid should be avoided due to blocking folate receptors (high circulating levels of folic acid are linked to autism and breast cancer), especially for those with variants in the DHFR gene. Certified organic flours are the only ones exempt from mandatory folic acid fortification. What else does fermentation do to bread? It decreases the amounts of starches resulting in a lower glycemic index and a healthier blood sugar response. A study published in the British Journal of Nutrition from the University of Guelph tested subjects’ carbohydrate metabolism, blood sugar, and insulin with four types of bread given at breakfast: white, whole wheat, whole wheat with barley and sourdough. The results showed that sourdough was far superior with a lower blood sugar response for a similar rise in insulin, and the subjects’ blood sugar was more stable in response to lunch and several hours later. The whole wheat came out on the bottom, even below white bread. It caused blood sugar levels to spike and lasted well after lunch. What about the gluten? One study found that gluten could be broken down to gluten-free levels in wheat bread after a 48-hour fermentation window. Another study from the Scandinavian Journal of Gastroenterology found evidence that the gliadin protein in ancient einkorn wheat may not be as toxic to those suffering from celiac. A significant reduction in mycotoxins also occurs during the fermentation process by the probiotic lactobacilli. That sourdough sandwich isn’t looking so evil now, is it? There is one caveat. When choosing sourdough, you have to look for “sourdough starter” on the label and not “yeast.” Sourdough bread that uses yeast for a quick rise is not real sourdough and will not deliver the benefits of real sourdough. In your Nutrition Genome Report, you will see genes like CYP1B1 (in the Detoxification section of the Nutrition Genome Report) connected to your detoxification of Polycyclic Aromatic Hydrocarbons (PAH), which can have carcinogenic properties and may affect breast, ovarian, colon, lung and prostate health. These compounds are created when we smoke or BBQ food, however, the greatest amounts are produced by the burning of coal, oil, and gas, which then plants like grains trap. When you see grains or vegetable oil seeds (canola for example) growing by freeways full of exhaust, you are seeing a plant with high levels of PAH. Probiotics reduce the concentration of PAH. One study found that after 3 days of fermentation, the probiotics Bifidobacterium bifidium, Streptococcus thermophilus and Lactobacillus bulgaricus reduced PAH by 46.6, 87.7 and 91.5%! Your good gut bacteria are B-vitamin factories, with bifidobacteria responsible for producing folate. Foods like celery, rooibos tea, parsley, oranges, broccoli and red wine also all help protect against PAH by improving CYP1B1 gene function. What if you are trying to balance a full-time job with late nights and a family, with little time to cook a full meal? Or you have struggled with digestive issues and absorption? Smoothies or juicing may be an easier option. If you make smoothies, you can freeze or buy frozen fruits and reap the same benefits. The good news is that frozen fruits and vegetables have been found in research to retain their methylfolate values in 12 months of frozen storage, making smoothies with frozen fruit/spinach and meals with frozen vegetables (use the quick thaw method instead of thawing overnight to retain the highest folate values) a great option for folate year round. 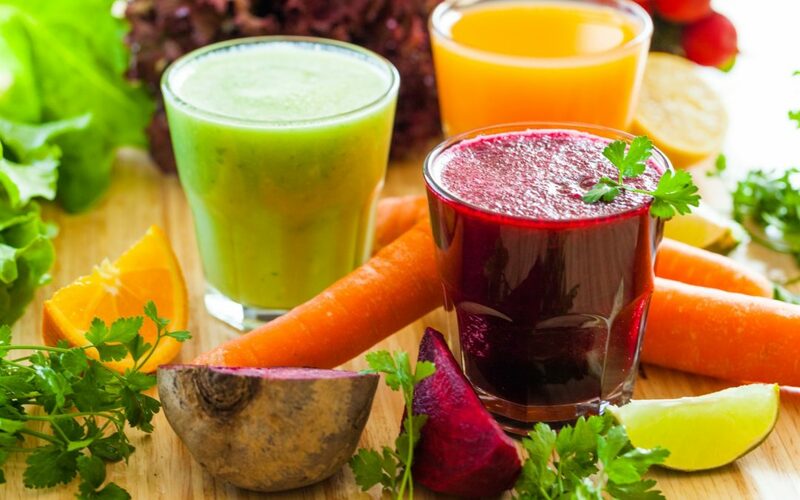 Juicing increases the absorption rate of folate by converting the polyglutamate form to a monoglutamate form that normally your body has to do when you eat the whole food. If your digestive system struggles, this may increase your ability to absorb folate. A masticating juicer for greens can help you hit your daily targets of folate, while also providing a supercharge of vitamins, minerals, and other compounds. High Folate Juice Recipes: 16 oz. Here are some high folate juice recipes that are also low in sugar.